This week I don’t have the most spectacular or artistic of photos, but it’s something that’s been very representative of our time in Turkey. 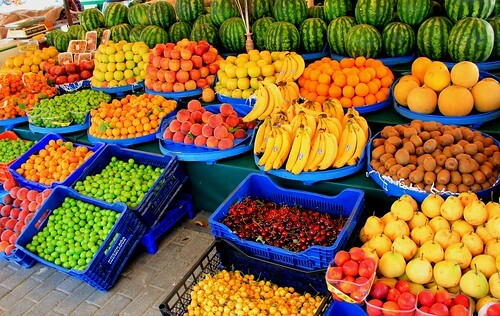 Turkey is the only country in the world that produces enough fruits and vegetables to feed its entire population. The only one! I am pretty amazed by that, and it certainly explains both the quantity and quality of fruits and veggies we’ve encountered here. You can get a kilo (that’s more than 2 pounds!) of cherries or apricots for about 1.75…it’s unreal. Breakfasts consist of tomato, cucumber, cheese, olives, bread, honey and in some places we also get huge slices of watermelon. 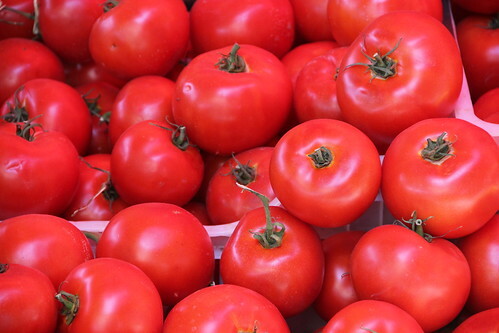 I’ve never seen tomatoes this consistently magnificent anywhere else in the world. I kid you not, every veggie stand we pass has crates and crates of the most perfectly ripe tomatoes. They don’t ever seem to be bruised, or picked too early, or worm infested. I buy them sometimes just to eat whole, like an apple. Mmmmmm. Doesn’t it make you want a smoothie? not like the bruised and battered fruit in Argentina, eh? Not so much…and even better than the fruit in Ecuador, which I thought was pretty fantastic! OMG!!! Fresh picked field tomatoes all year around!!!! I have as hard time finding them here in August. What a gorgeous picture of the fruit/vegetable stand. Only thing that’s missing is that fantastic corn you can get in Ouray in the summer…Olatha corn? MMMmmmm…. I’m looking forward to all those fruits and veggies in Turkey! That’s awesome! You are going to LOVE Turkey! Fantastic food, really nice people, it’s a beautiful place.